Rupert Pupkin Speaks: Favorite Underrated Horror - Mark Hodgson ""
A movie-goer since 1966, Mark Hodgson is the sole writer behind blackholereviews.blogspot.co.uk which started in 2005. 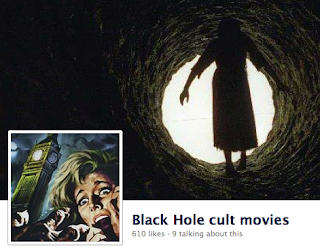 Twitter addict and hoarder of movie ephemera, he works in an independent TV post-production house in London. This was recommended in one of my first books of horror films, Horror In The Cinema by John Brosnan. It's certainly off the radar at the moment, never having hit DVD anywhere. But this is a tight, twisty thriller, written by Joseph Stefano - the scriptwriter of Psycho, and sort of belongs in the 'animal attack' genre. While cats in horror films aren't always threatening (awwww), the unease is heightened by our hero having an intense fear of them. Their presence makes us anxious because he is, thwarting his attempts to get his hands on his frisky aunt's fortune. 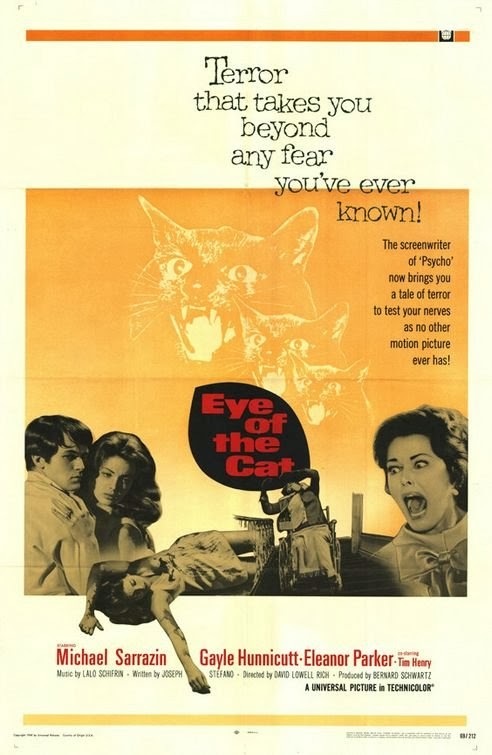 Cats are used ingeniously throughout the film and I'd nominate this as the most effective 'cat horror' movie as a result. There's also a dark sense of humour, the setting of free-loving sixties San Francisco together with a crucial hilltop location for the mansion. With Eleanor Parker, Michael Sarrazin and Gayle Hunnicutt heading the cast, and a tense Lalo Schifrin soundtrack (he's always scoring San Fran films), this and William Castle's The Night Walker are still at the top of my not-on-DVD list. I thought that the return of survival horror films would help the fortunes of earlier examples. After And Soon The Darkness was remade, I was also hoping to see more mentions of this other Brian Clemens script. Blind Terror is currently bad to Google because it's now sold under the name See No Evil, while being nothing to do with the 2006 horror with the same name. Directed by Richard Fleischer (The Boston Strangler, Soylent Green and many more), Blind Terror also boasts a terrific, over the top soundtrack by Bernard Herrmann. This is currently on DVD, but I don't hear it mentioned enough. After the career interview with Mimsy Farmer (Four Flies On Grey Velvet) in Video Watchdog, I had a Mimsy-marathon of as much of her dramatic work as I could find. 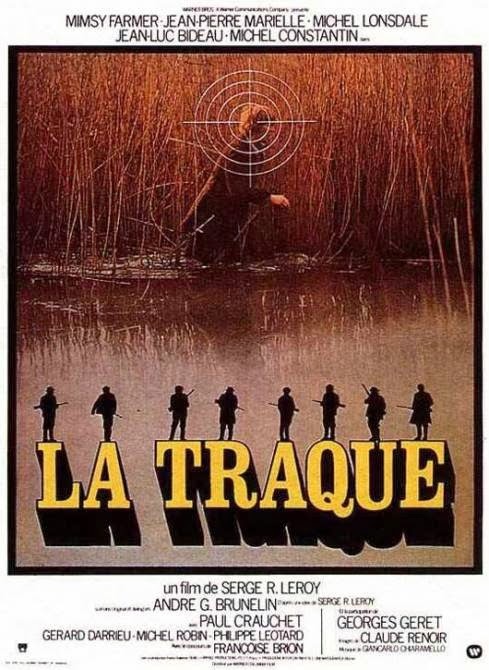 My favourite film wasn't any of the weird and wonderful giallo she'd done, but a super French thriller with an ensemble cast. She plays a teacher, new to a small, tightknit village in the country. She gets on the wrong side of a local hunting party of friends and ends up as the hunted. Again, the plotting is tightly logical, and the hunters made up of all levels of society also invite some cutting social commentary. Beautiful cinematography of the countryside contrasts with the cruelty. Great performances and constant tension, from the very first scene, made this unforgettable. Mimsy thinks it's the best film she's been in, I'd agree, so why is it not on DVD anywhere, not even in France. After being scared silly by the many Japanese Grudge and Ju-on movies, I tried to track down everything else writer/director Takashi Shimizu had done. What I found to be his scariest, most consistent horror film is far less known all the Grudges. Rinne is a stand-alone story. An early scare involves a tree at night, it's shadows full of dead faces. Random hauntings occur parallel to the story of a young actress joining the cast of a horror film that's based on an actual murder case. Problems begin when the cast visit the original location, a remote hotel, and pursue them back to the studios while they complete filming on a replica of the murder scene. Shimizu has constructed a complex scenario, but conveys the multiple realities (the original murders in flashback, the actors recreating them) without confusion. It's an admirable and creepy nightmare. 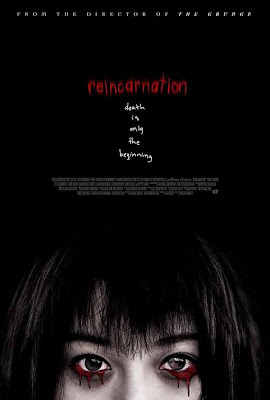 Terribly overlooked, though the title doesn't sound scary at all, and not helped at all by the US DVD cover art, not nearly as good as the Japanese posters. What appear to be a series of suicides are investigated by a young man who can enter the minds of others. Director Shinya Tsukamoto is perhaps better known for his wild and untamed Tetsuo The Iron Man films, which are perfect visuals for speed metal, or in my case, a blinding headache. But Nightmare Detective is a much later work and quite restrained, except maybe for the unorthodox detective's Tetsuo-style nightmares. While shakey-cam and fast editing are a current trend, Tsukamoto was not only an early practitioner, he has mastered the technique. Enabling the narrative to continue during the wild camera movements. But here Tsukamoto has now clearly mastered carefully-paced mystery. The quiet, tragic drama of the police investigation into an apparent suicide case is made even more downbeat by the 'nightmare detective' himself, psychologically tortured by his own special powers. A great cast, headed by Ryuhei Matsuda (Rampo Noir, The Raid 2), this is available on US DVD, again with wildly unsuitable cover art. A sequel has been made in Japan, but isn't yet available with English subtitles. Haunted apartments are practically a genre now, and while Dark Water is highly praised, Apt. was far less predictable. 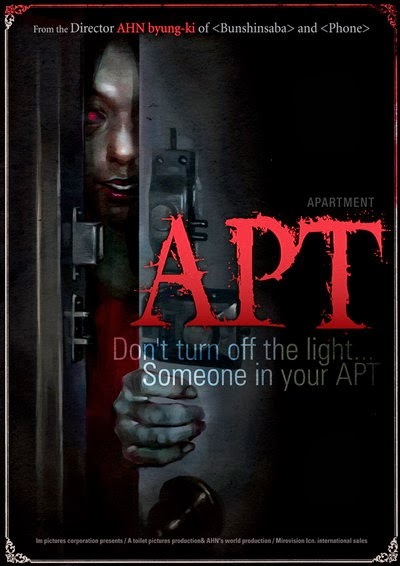 Annoyingly Apartment 1303 from Japan has eclipsed a similar setting and name, and is even better known because of an American remake. But Apt. is the more elaborate and well-constructed chiller, with echoes of Hitchcock's Rear Window and a logical, intricate story. I don't think Apt. has been released in the US or UK.